Dill weed is dried by laying the whole plant on vented racks inside a drier unit, at a 30 degree angle. The rack's vented surface and angle of placement allows air to circulate freely through the plant material. Heated air (not exceeding 110 degrees Fahrenheit) is circulated through the drier, while a dehumidifier removes moisture. It is necessary to expose the plants to both a heat source and a dehumidifier to prevent them from molding or decomposing in their own moisture. The plant material remains in the drier until a moisture level of approximately 8% is reached. After drying, the leaf and stem is separated from the dill tops. 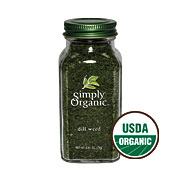 Simply Organic Dill Weed is shipped in a discrete, unmarked package. Orders are processed immediately and usually take about 3 to 5 working days to be received. We do ask that you try it for 2 to 3 weeks to feel the full effects. Any information received is used only for order processing and shipping purposes. Your information, such as e-mail address, will never be disclosed to a third party.